The Verse’s Jake Francis reviews The Age of Terror at the Imperial War Museum, exhibiting until 28th May 2018. [At] 9/11 people started laughing, and I know it sounds terrible because we all went through so much, it was all so tentative…we ended up with 2400 widows…each of which – this year – finally ended up with a cheque of $5,000,000 each. I was thinking, any of you who’ve had a partner for over six years – which would you rather have? It took comedians almost an entire year to make a public joke about September 11th – it understandably receiving damnation from groups and individuals alike on a global scale. Despite its natural tendency to cut far too close to the bone, its slow teasing into social culture marked a step towards a unified grieving process. Although the words land with a sore thud, and may even generate a cascade of tears, it has allowed individuals to take a wobbly lunge into a creative outlet for their feelings – and in many ways, this exhibition personifies just that – a middle finger emerging from the rubble. That being said, it would be reductive (and patronising) of me to say that this show is perfect – because it certainly isn’t. Although the premise is one that immediately resonates with any millennial, it does have a handful of works which simply do not fit – or may just appear feeble alongside the greats. But let’s not focus on those – for it would be both unnecessarily negative, and boring. I should also state now, before we get into the main ‘bulk’ of the retrospective, that the quantity of works and the necessary critique of each is vast – to do it justice would be to write a small book, so apologies if the upcoming tirade appears a little crass in its duration. On entering the gallery, perverse attentions are naturally drawn into Tony Oursler’s cadre of headlines, his work 9/12 Front page (2001) collecting the oddly mimicked format of international newspapers trying to make sense of this new era in civil state journalism; the cynical among us (including myself), naturally scoffing at the fear mongering within each page – one stating ‘is this is the end of the world?’ Stepping away from the brittle truths of media culture, you’ll find the fantastically simple Potential Terrorist (2001) from Kerry Tribe – the video making an immediate correlation between our perceptions of what a terrorist should/would look like, and how wrong that presumption often is. Mere feet away from this subtler commentary on Western bias, is the video installation of Fabian Knecht, titled VERACHTUNG (2014); the footage consists of the artist himself standing on a New York street wearing an almost cliche outfit of a 9/11 aftermath – the speckled and dust-laden suit. After reading the text that accompanies the work; however, it is soon clear that the apparel is from an actual 2014 suicide bombing in the Middle East – Knecht reminding us that there are casualties on both sides of the equation. This empathetic, ‘not so patriotic’ expression of global epidemics is drawn up time and time again throughout the exhibition – it eventually leads one to consider that perhaps not all Western artists are as shallow and as short-sighted as they are often perceived to be… Both Jim Ricks and Christoph Buchel acknowledge this parallel quite literally, their works Made in Afghanistan (2001-6) and Capet Bombing (2015) marrying traditional middle eastern skills with the dystopian realities of US remote-warfare; the irony of the West’s response to homeland disaster is not one that is easily ignored. Amongst these ‘precise’ art works of 9/11 topic, you will also find ones that hover within the personal. When September 11th is mentioned in everyday life, it has almost become a ritual to share with those around you exactly where you were and what you were doing on receiving the news or turning on the TV; this is personified quite literally in Grayson Perry’s pot, Folks at Dungeness, September 11th (2001). The work vividly depicts the shift in the artist’s priorities in the studio on the subsequent day that followed the disaster. This therapeutic activity can also be found within the novel yet powerful, Tuj (2012) by Khaled Abdulwahed. The video depicts a worn football bouncing from floor to wall over and over again – the act serving as a metaphor for the resilience of children within the war zone, and the escapism they can find within a simple game of football, even if the goal post are marked by piles of rubble; the resemblance of the video to the film trope of a prisoner biding his time in solitary confinement does not feel unintentional. If this all seems a little too heartfelt and soppy to you (which at times, it did for me) there are those within the exhibition who have no qualms in bruising the audiences ribs whilst digging their tongues deep into cheeks. It may come as no surprise that The Chapman Brothers fall into this category, their all-too-familiar miniature Nein! Eleven? (2013) formulating a literal pair of piled corpses in the fashion of the two towers. This unnerving yet enticing artwork from the Chapmans, however, is soon trumped by Cory Archangel’s found video game Bomb Iraq (2005) – a side clicking, Microsoft-paint interactive story that pre-dates the 9/11 attack, allowing you to be ‘the finger on the button’ -a click of a mouse away from inhalation. Each of these works could easily be cited as profiteering for headlines and attention, and in many ways that argument would be valid. But like the opulent glass grenades found within Mona Haltom’s cabinet, Natura Morta (2012), the Chapman bros and Archangel ask an important question: Have we learnt anything from our past of bloodshed? And is there such a thing as ‘the bad guy’? Overall, Age of Terror is one that does not shy away from 9/11 in its entirety – including both the natural empathy, and the necessary questions posed to our trans-Atlantic cousins. No one could deny that 9/11 is not something to laugh about, but art (like humour) needs to allow a public dialogue – and that does not always land comfortably. 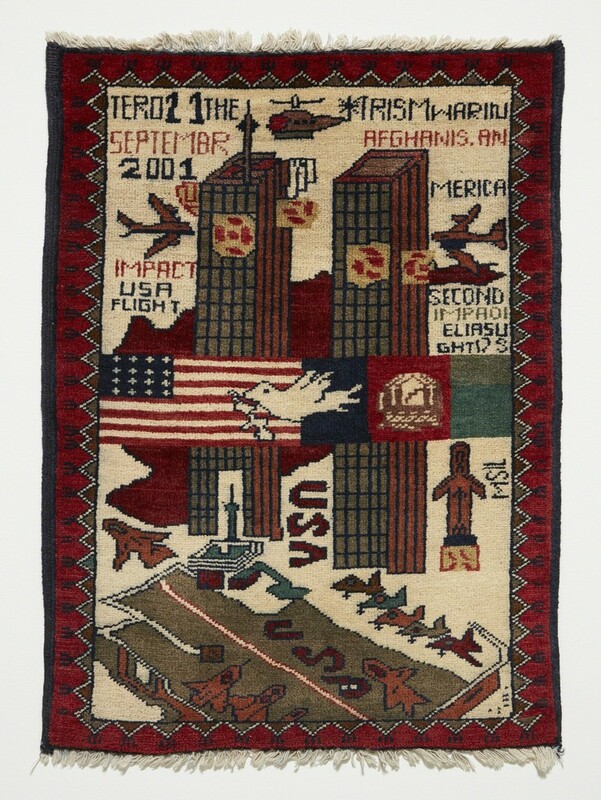 Age of Terror: Art since 9/11 is now on display at the Imperial War Museum until 28th May 2018. Concession entry is £10.50.